Join us as we kick off our Midwest Fallout Tour, starting August 23rd in El Paso, Texas. Check out all of our tour stops at the tour dates page, we hope to see you there! Our new EP "This House" is now available! Buy it now! 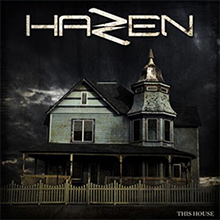 Hazen's "This World is Mine" official music video is out NOW from the EP "This House" available April 6th. Watch it now! Join us on July 22nd as we rock the stage with Gemini Syndrome, Code Red Riot, Paranova, and Sin Shrift! Check the tour dates page for more information. Check us out on July 7th as we headline an all female-fronted lineup at Pub Rock in Scottsdale! Check out the tour dates page for more information. Join us on May 26th as we play with Note to Self at Club Red! Visit the tour dates page for more information. Formed in 2017, Hazen from Gilbert, AZ raced into the Arizona Alternative Metal market by storm with its powerhouse female vocals and heavy and melodic riffs. They released their initial debut EP “Undone” on May 19th, 2017 which sprouted a buzz around the scene in Arizona. Playing with acts like Xandria, Letters From The Fire, and Powerman 5000. After releasing their second EP “This House” in April 2018, a new buzz emerged. Playing with acts such as Rivals, Gemini Syndrome, New Years Day, Adelitas Way, Code Red Riot, and more. After headlining their Midwest Fallout Tour in late 2018, they gained the attention of hundreds of thousands of people through an online reach. Streaming in over 52 different countries, collectively over 500k views on their YouTube content, tens of thousands of monthly listeners on Spotify with over 200k streams and counting. Hazen is now set up to play direct support for Godsmack at Arizona Bike Week 2019. This band will stop at nothing and shows nothing but an exciting and promising future as months unfold.